Increase the success rates and overall health by giving your seedlings and clones the ideal light for their stage. View our selection of clone and seedling lighting that work great with cloning machines and propagation trays. Provide your seedlings and cuttings with high quality rooting aids like Clonex! This popular natural root stimulator is available in a gel, as a clone solution and in a mist. Propagation trays, domes, and rooting plugs work together to create the perfect environment for clones or seedlings. As these new plants begin the early stages of life, they need ideal conditions to succeed, and at Hydrobuilder, we make this simple. What is a seedling tray? Seed starting trays are the foundation of your propagation system, and are designed to hold the seed or clone starting medium and the seed or clone itself. Using a tray simplifies transplanting when the time comes, especially if you use a rooting plug. Propagation trays do a great job or draining water and nutrients, ensuring the plant remains in a fresh solution. The individual holes ensure every seedling or clone gets fed. What is a humidity dome? The second component of your clone or seedling system is the humidity dome. Also known as a propagation dome, this covers your seedling tray, and helps maintain proper temperature and moisture levels. Clones and seeds need humidity of 75%, and temperatures of 75-80 degrees Fahrenheit. Most domes include vents, as you will slowly lower the humidity as the plant takes root. 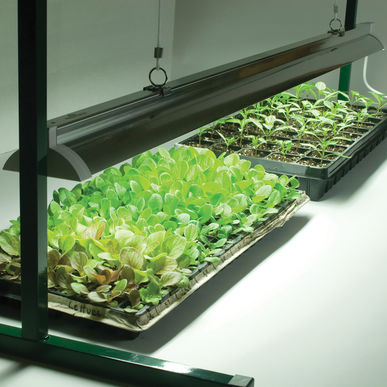 Most growers implement a heat mat to raise temperatures, and a hygrometer to ensure the humidity is where it needs to be. When should I remove the humidity dome for clones? For the first 5-7 days of growth, you can slowly open the vents on your dome. As you watch your plant grow, watch for wilting or signs of dehydration. If you see this, close the vents. After 7-10 days, you should start to see roots. At this point, you can remove the dome completely, but remember to watch for stress signs. Rooting plugs, also known as seed starting plugs, are an easy way to plant your seeds into your propagation tray. These are sold in bulk, and provide great aeration while still retaining moisture and nutrients for the seedling or cutting. These starting plugs will not affects plant pH. How do I start seeds in trays with a seed starter? First, you will probably need to soak your seed starting plug to make sure the seedling or fresh cutting has access to moisture immediately. Then, simply place the seed into the plug, and place the plug into the tray insert. It is important to maintain optimal moisture levels in the plug, as it can be difficult to re-hydrate them once they become dry. Once the roots begin to take, the plant can be transplanted to larger containers or into the ground without removing from the plug. Growers love using rooting plugs for their ease of use. If you are interested in learning more about propagation, check out ourdefinitive guide on how to clone a plant in our learning center! If you still have questions, our experienced growers can be reached at 888-815-9763!